Herbal support for stamina & lethargy, recovery from illness. This fast acting herbal supplement contains a combination of botanical extracts to help support stamina, immunity and general wellbeing. 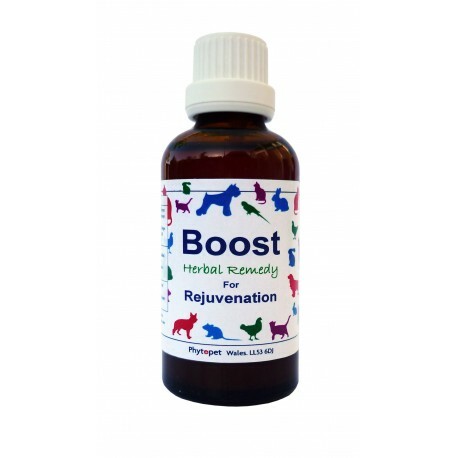 Use daily to help your pet maintain peak performance and condition. Indicated for recovery from illness, lethargy and generaly feeling 'run-down'. A traditional Indian ‘cure all’. Famous for its ability to balance the body’s immune system. Renowned for it’s ginseng-like effect. Known in Chinese herbal medicine as Huang Qi, a good tonic herb. Immune boosting, liver supportive. Shown to be useful in chronic fatigue, probably due to the immune system enhancing properties of the herb. Probably one of the best known herbal remedies available. Its actions are adaptogenic and rejuvenating. Shown to improve physical and mental stamina, increases circulation, helps with recovery after illness or surgery, lifts mood, and stimulates the immune system. Schisandra’s actions are adaptogenic, anti-stress, anti-fatigue, immune system enhancing, it also acts as a liver tonic. Used in traditional Chinese medicine to enhance physical and mental endurance and performance. Rich in minerals particularly iron. A traditional blood tonic, given at change of seasons to ‘cleanse the blood’. The whole body feels the influence of Nettle, its actions being mildly diuretic, expectorant, vasodilatory, hypotensive; it eliminates uric acid from the body, acts as a tonic for the spleen and strengthens the body’s immune system. ‘No plant is more useful in domestic medicine.’ (Hilda Leyel). Rich in vitamins and minerals and a good source of vitamin K. Alfalfa is also rich in chlorophyll, making it useful for connective tissue repair. Its action is nutritive and strengthening. ‘Taken regularly, it is believed to dispose to mental and physical well-being.’ (Thomas Bartram). In Chinese medicine, Liquorice is traditionally used for strength and long life. A good herb for dry coughs, ulcers, etc. One of its main actions is as a tonic for the adrenal glands, thus making it useful in all cases of adrenal insufficiency. A noted Chinese herb of longevity and energy. Nutritional yeast, rich in B vitamins. Extra non-acidic vitamin C in high doses (100-500mg 2-3 times per day). Essential Fatty Acids (EFAs) Hemp seed oil and Linseed ouil are good examples of a correct balance of Omega 3 and Omega 6 EFAs. As the name suggests these fats are essential for health. A deficiency in EFAs can lead to a number of illnesses, some serious. Our K-9 Sure Daily Sprinkle is a combination of Nutritional Yeast, Herbs and Seeds rich in vitamins, minerals and omega 3 & 6 oils. Use daily to help maintain optimum health and well-being.